Explanation: As far as the eye could see, it was a dark night at Las Campanas Observatory in the southern Atacama desert of Chile. 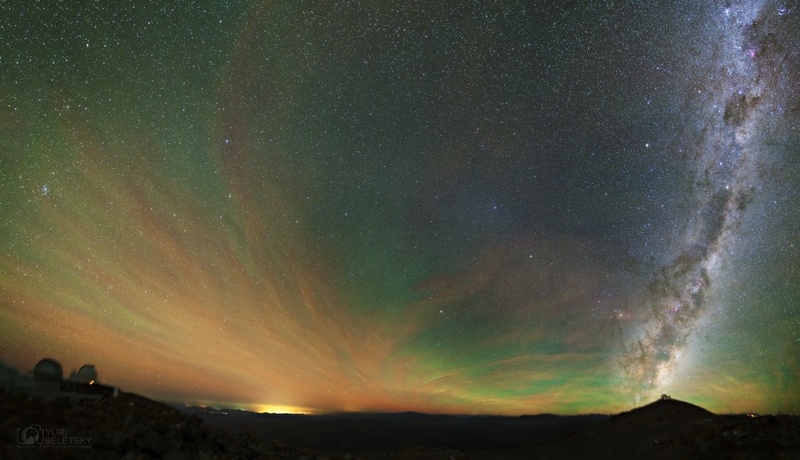 But near local midnight on April 11, this mosaic of 3 minute long exposures revealed a green, unusually intense, atmospheric airglow stretching over thin clouds. Unlike aurorae powered by collisions with energetic charged particles and seen at high latitudes, the airglow is due to chemiluminescence, the production of light in a chemical reaction, and found around the globe. The chemical energy is provided by the Sun's extreme ultraviolet radiation. Like aurorae, the greenish hue of this airglow does originate at altitudes of 100 kilometers or so dominated by emission from excited oxygen atoms. The gegenschein, sunlight reflected by dust along the solar system's ecliptic plane was still visible on that night, a faint bluish cloud just right of picture center. At the far right, the Milky Way seems to rise from the mountain top perch of the Magellan telescopes. Left are the OGLE project and du Pont telescope domes.